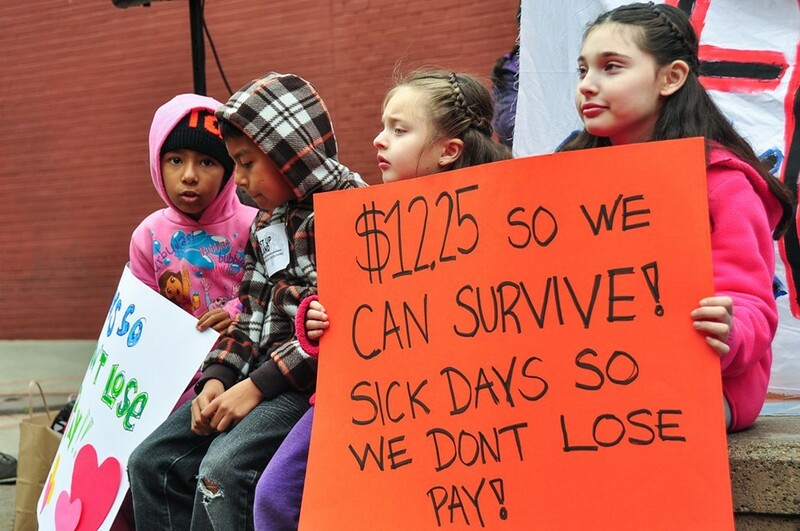 A coalition of activists and community groups is one step closer to raising the minimum wage in Oakland and setting new standards for paid sick days. Lift Up Oakland, the group leading the initiative, announced this morning that the Alameda County Registrar of Voters has verified the signatures on its ballot measure proposal to raise the minimum wage to $12.25 an hour. That means voters will have an opportunity to weigh in on the proposal in November. If the ballot measure ultimately passes, as many as 48,000 workers in Oakland would get a raise, along with 56,700 receiving sick days, according to Lift Up Oakland's estimates. In addition to establishing the minimum hourly wage of $12.25, the proposal also includes a provision for annual cost-of-living increases. It also sets a base of five or nine paid sick days depending on the size of the business. It would further require that the service fees hospitality employers charge go to the workers providing the services. The group said it submitted a total of 33,682 signatures from Oakland voters, with the support of hundreds of volunteers and a number of labor unions. Income inequality in Oakland is a crisis. Workers need relief. Our proposal will help low-wage workers make ends meet. Some business organizations are trying to water down this proposal, but people need to be able to put food on the table today. In today's announcement Lift Up Oakland cited a recent analysis from UC Berkeley policy experts showing that hourly wages and annual incomes would rise to such a degree that increased annual earnings could amount to as much as $120 million total. Hourly wages, the researchers found (PDF viewable here), would rise by an average of $1.69 per hour and average annual earnings would increase by about $2,700. The authors of that report also said the minimum wage increase would have a "modest impact" on businesses' operating costs and consumer prices; for example, restaurants' operating costs could increase by about 2.8 percent with prices increasing by 2.5 percent, according to the analysis. People of color would especially benefit from the passage of the proposal, that study also said, noting that black, Hispanic, and Asian voters make up about 62.1 percent of the total workforce in Oakland, but represent about 78.7 percent of those that would be affected by the increase to $12.25. The debate around raising the minimum wage has become an issue in this year's crowded mayor's race.